This quiz is designed to assess your basic knowledge in 'Darwin's theory of Evolution'. Choose the best answer from the four options given. When you've finished answering as many of the questions as you can, scroll down to the bottom of the page and check your answers by clicking ' Score'. Percentage score will be displayed along with right answers. 1. Which of the following is the most critical factor for evolution according to Darwin? 2. Darwin mentioned an island as the “living laboratory of evolutionary samples”. Which is that island? 4. 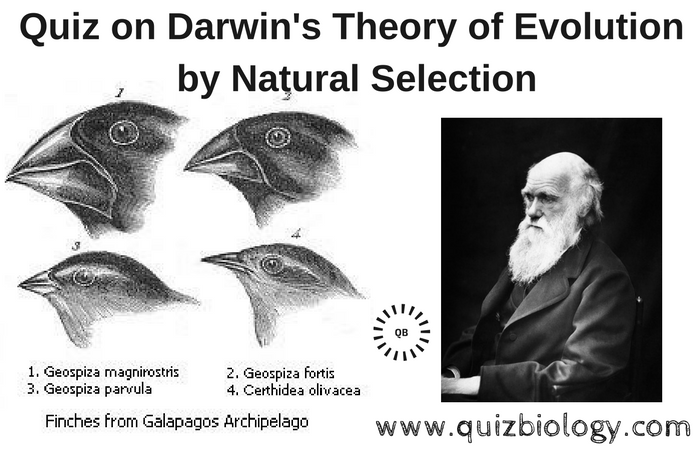 Which is the book in which Darwin published the theory of evolution? 10.Darwin got the idea of natural selection while observing variation of species in different islands. Which is the most important species that helped him to propose the theory of natural selection?